Designed for portable applications, the WAR series resistive and reactive load banks are weatherproof construction, designed for harsh and tough environments, for testing and commissioning of generators. Featuring rugged stainless steel immersion proof and vibration proof resistors, high quality class F reactors, integrated switchgear with individual load circuit breakers. Control is portable, remote data capture with touch-type Key pad and PC interface. WAR Series portable load banks incorporate 1kW or 1.25kVa increments for testing small to large generating sets. The fine control resolution ensures accurate load control and power factor targeting adjustments. Typical applications include generator manufacturing, workshop type servicing and on-site commissioning. The units are portable and suitable for trailer mounting. WAR series load banks are completely weatherproof to IP55 (NEMA 3R), vertically fan cooled incorporate SEPHCO SDL stainless steel immersion proof, vibration proof resistors and high quality copper wound Class F reactors. WAR series load banks incorporate LCD display type LC12D portable controllers with touch-type key pad, controlling distances to 100m metres. Features also include fan start-up, adjustable commands of KW, KVA, PF, Hz and Volts plus programmable routines and fault diagnostics. 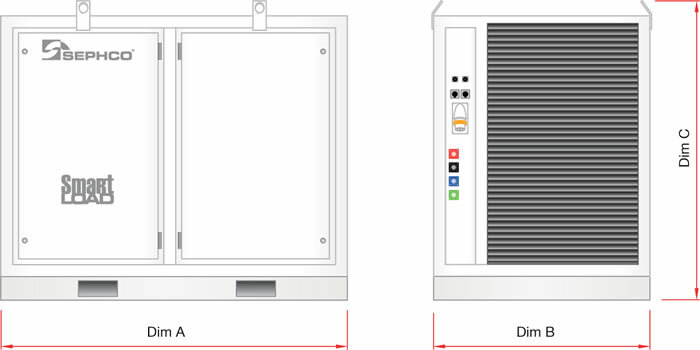 The controller is a state-of-the art robust weatherproof unit, complete with USB port for connection to a PC.Additional features of Sephco load banks include circuit breaker protection for each load group and full accessibility to switchgear components and resistors. Safety protection includes the SEPHCO Triple Interlock load protection system, which safeguards against fan failure, air flow restriction, high temperature and fan reversal. Software protection also detects incorrect programming and safeguards the system against over-voltage and incorrect frequency input. All WAR series load banks are supplied with control cable and type LC12D weatherproof portable controllers. Units are fitted with standard external power sockets and fan reversal switch. Options include digital display power meters, trailers, cable reels and PowerLock connectors. This entry was posted in WAR TYPE. Bookmark the permalink.